The multifunction display indicates operating data, battery capacity, operating hours, errors codes and information. Graphical symbols on the multifunction display issue warnings. The residual capacity available is indicated. Display 0% = battery discharged by 80%. 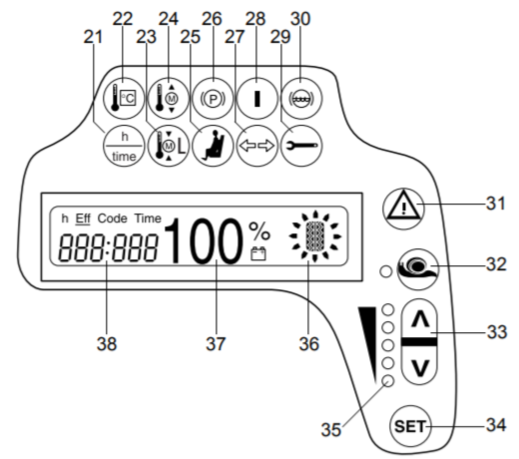 With a 10% display, the Attention display (42) flashes. The lifting function is disabled after 30 to 40 seconds at a capacity of 0%. – The operating hours display is cleared when an error (Err) or a warning (Inf) is received. The error code is displayed. 1.5 seconds, and a warning tone sounds.